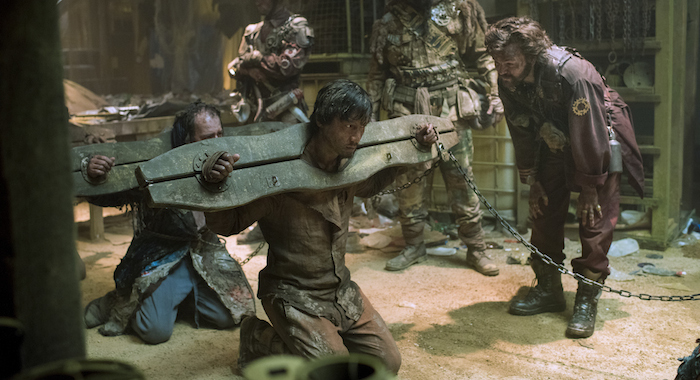 Why he won't do martial arts for the 2018 Lara Croft film and how he made his Badlands fights harder. Daniel Wu’s association with Rotten Tomatoes goes back to the site’s early days. He traveled to China with site founder Patrick Lee to practice Wushu in the ’90s before the Tomatometer was even a blip on the World Wide Web. Wu remains good friends with Lee and cofounder Steve Wang. 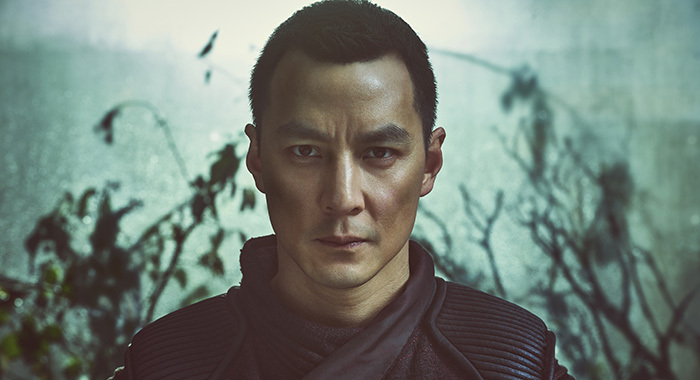 And even though this American-born international action star is now in South Africa shooting Tomb Raider — with Alicia Vikander starring as video-game heroine Lara Croft — Wu made time to chat with us about his role as Sunny in AMC series Into the Badlands. Season 2 of the series picks up six months after the first. Sunny is now in a slave camp where he meets a new ally Bajie (Nick Frost), and they plan their escape. Not even a pair of stocks can hold Sunny. Expect him to not only break free, but use them as a weapon too. 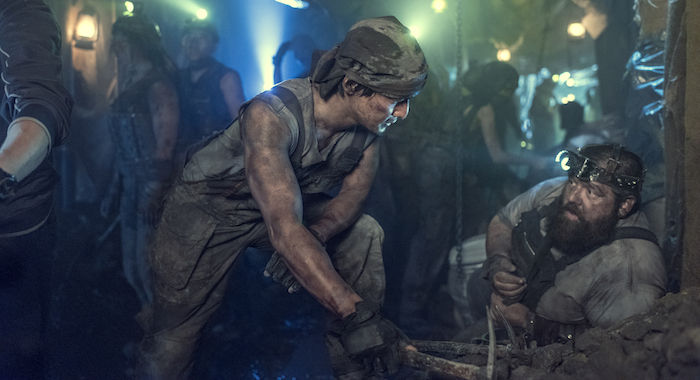 Calling during a break in Tomb Raider production, Wu talked about the series, the Lara Croft reboot, and the upcoming disaster movie Geostorm, directed by Independence Day producer Dean Devlin. Fred Topel for Rotten Tomatoes: There’s no faking the stocks, is there? You have to actually put your hands in stocks. Daniel Wu: Yeah, and actually we had prepared a balsa wood light version of it so it would be easier to fight in. The first move I did, it just completely exploded. We didn’t have time to make another one. We just took the real wood one and I fought with that the whole scene. It was pretty tough. It probably weighs a good 15 pounds. So it’s not super heavy but it’s enough to throw you off in terms of balance and all that kind of stuff. Eventually I figured out the best strikes you can do with this are big swinging strikes. Obviously with the splits and jumping onto the rack and all that stuff were other ideas. We had a plan for this season for Sunny to fight with much more adversity than last season. Last season he was almost untouchable until he fought the abbot in the last episode. So this season, because he’s been taken away and became a slave, he’s been weakened and been in prison for six months, he needed to have this learning curve to get back to where he was last season. All the first few fights, there’s a bunch of adversity like that that he has to get through. The first one he’s in stocks. The second one he’s chained to Bajie. Normally, he could easily win the fight but with these extra hindrances, it makes it much more difficult for him. RT: You were mostly with M.K. (Aramis Knight) last season. How different is having Bajie as your partner? Wu: Oh man, I love it. It’s so awesome because it adds a bit of levity to the show. It was definitely great for my character, Sunny, because it gives me a partner to even have dialogue with. Last season, Sunny was a man of very few words, not because of his situation but mainly because he just didn’t have people to talk to about what he was planning. This season, we can have a dialogue and you can see how Sunny’s mind is working. But you also get this odd couple pairing where they’re almost two opposite ends of the spectrum of people. Sunny comes from a noble warrior class and we’re not quite sure where Bajie’s from, but he’s been a slave. He’s learned to survive outside the badlands but we’re not totally sure what he is. RT: We know from his movies that Nick is a big movie geek. Is he a big martial arts movie geek? Wu: He’s more familiar with Western martial arts movies, like the older Van Damme/Seagal/Chuck Norris–type stuff which is still cool. Not so much the Hong Kong–Chinese stuff. We were able to educate him on that as well. 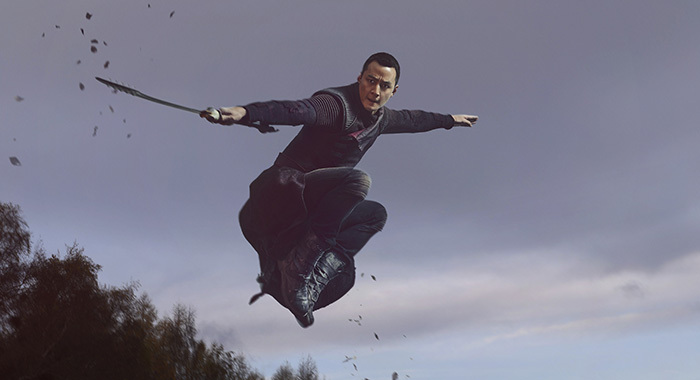 RT: Is there a chance to open up the world of Into the Badlands and explore corners you didn’t get to in the first season? Wu: You get to see what the world is like in the outlying territories. People are living there. Last season, people were like, “Why don’t you get the f— out of the badlands?” You realize outside of the badlands is actually a much worse place to be. The badlands is more civilized. Last season we filmed in New Orleans, and there’s really not much geographically to look at there. It’s all black and swampy. Moving to Ireland, we’ve got mountains, forests, oceans, all that stuff within 30 minutes of our base. You could get really epic, movie-like shots that we couldn’t really do last year. RT: What other fights should we look for later this season? Wu: The third episode, we see this new character named Moon. That fight I really liked a lot. It’s a complicated fight but I like it because it’s a metaphorical fight. It’s actually a fight that’s about a spiritual meaning and not about trying to get somewhere or a plot device. This character challenges Sunny philosophically as well as physically. By the last episode, there’s an amazing fight that is really emotionally charged. You’re going to see something very different than last season where the fights were fights and the drama’s drama. We’ve more integrated the fights into the story better so the fights drive the story along. RT: Does Tomb Raider have a martial arts component to it? Wu: No, not at all. That’s why I did it. Prior to Badlands, I had actually not done anything martial arts–related in five years. In my mind, I had kind of retired because of various injuries and all these other things. I also had done a lot of martial arts films in Hong Kong, but I made sure that I was very careful not to be pigeonholed as just a martial arts actor. That’s the same thing I’m doing with my American career as well: Tomb Raider, Geostorm that’s coming out in October also is very different — I play a nerdy engineer. In Tomb Raider, I’m a ship captain who helps Lara out on her journey. RT: Was he a character in the video games? Wu: I don’t think so actually. RT: Even without martial arts, Tomb Raider has big action. How do you find the Hollywood brand of action? Wu: It’s very different than what we do. Our choreography [on Badlands] is built for a certain shot. Here, it seems like they choreograph a big fight scene and shoot it a whole bunch of different ways and you just keep repeating it over and over and over until they’re done shooting it. For Badlands and the Hong Kong–style action, we start at the beginning of the fight and we work our way all the way through until we’re done at the end. We’re not backtracking. We’re not starting over again. We work in chronological order through the entire fight. RT: Is there a chance your character could return if Tomb Raider becomes a franchise? Wu: I think definitely. Spoiler alert: I don’t die. I could definitely return to help Lara in the future. RT: How is Alicia as Lara? Wu: She is a beast. I fell in love with that robot in Ex Machina. She’s a huge reason why I wanted to do the movie. She is so focused and so serious on this movie and with the action, completely fearless. She’s completely thrown herself into it. I’ve been doing action for a long, long time. For someone who’s very fresh to action movies to just jump in without any fear like that is pretty rare. I really respect her for that. RT: And what is director Roar Uthaug bringing to Tomb Raider? Wu: I really liked the movie The Wave he did. It was a really great balance between really human drama and this kind of event movie action. That’s part of the reason I did this movie as well. I thought there was a great opportunity for good storytelling as well as great action. He was the right director for this job I think. RT: Have you gone back for any additional shooting on Geostorm? Wu: No, I didn’t need to do that. RT: Is Geostorm a big disaster movie? Wu: Worldwide major global disaster. Simply put, we’re in the future. There are these special satellites that control the world’s weather so we don’t have natural disasters anymore. As the story starts, there is a significant weather disaster and they’re wondering why. They realize there’s a glitch in the system, and they send Gerard Butler out into space to investigate, while people on Earth are trying to figure out what’s going on.